Fabien Letouzey wrote: No: it was Scan 3, and I didn't change the program during the tournament. However I remember that GWD (and maybe Dragon Draughts) was modified between the two days. IMO it makes the tournament results harder to interpret; for example Scan played an improved GWD compared to others, but I might remember wrong. Thanks for the reply Fabien. I have noticed that some programs always maintain their high level on the Olympics. Scan played 35... 7-12? here and white created breathing room with 36. 23-18!, and although it looks promising for a while, there is no black win according to Kingsrow. It is a honour for me to see your reference to Damy to analyse this still very difficult position in a game Mobydam - Scan!!! Yes Rein 35...7-12 seems not the best move for Damy. That does not meen that the position you mentionned is a draw and I see another possibility. The idea is to keep a man on square 1, to wait for a white man coming on square 22 and to organise an attack against 22. You are welcome. I actually meant that it was a type of position well suited to you for optimizing Damy, and you seem to enjoy such analyses. With Kingsrow + 8 piece db the quality of analysis is rather similar, but my time is limited. 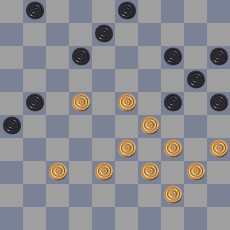 In the game black played 17-22 and did not manage to win. (15-20) 32-27 (15-20) 30-25 (7-11) 16x7 (12x1) 21x12 (18x7) 36-31 (33-38) 44-39 (7-12) with probably a win. I'm not sure it's a win, but after 62 seconds Sjende Blyn switches from 17-22 to 15-20 (value -1.3 man). 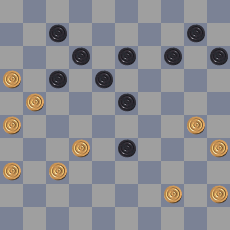 Are you interested by knowing if (15-20) is a winning move or not? If yes did you find another white move in the line above on which white might reach a draw? Hi Rein, that are a lot of questions! That Sjende Blyn is getting better is because I'm working on it on a regular (and irregular!) basis. It's written in C++. The positional evaluation is handwritten and is partly bitboard, partly array based. The database is 6p. 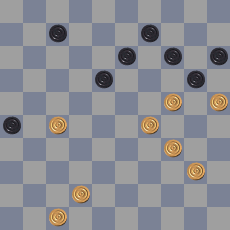 Do you develop draughts- or chess programs? Thanks for the info. 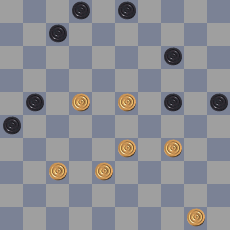 To your question, the answer is yes and no: I am writing a C++ template library that you can use to play draughts with any existing rules / board combination. Eventually, it wil have a complete engine class, most of the ingredients are there but in varying degrees of completion. No doubt for me that the line you show here above is surely a winning one: though Damy has not proved strictly the win I could see that the evaluation reached +4 after 30' and +7 after 8 hours (I was not able to wait more time because I got out of memory). Anyway no real risk for me to claim for a black win! What was the endgame moves? A few moves further in this game (and Deep Nikita in more trouble than it is here if I recall correctly) Andrew made a mistake in entering a move, which was discovered a little later when Sjende Blyn went for an "impossible" combination. He tried to correct it, but did not succeed. 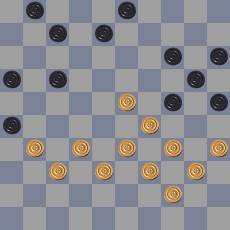 In the process, I reverted several moves played in the game, so all the moves played from this position were lost. Ok, I will add this alternative to toernooibase.